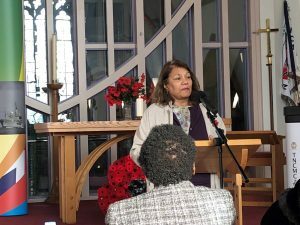 I spoke at the remembrance event at the Crossing at St Paul’s on Saturday 10 November 2018. I spoke about the need for unity among all groups and the sacrifice made by the people of the Commonwealth. I mentioned the ‘Blood Swept Lands and Seas of Red’ installation at the Tower of London which commemorated the centenary of the outbreak of the First World War. 888,246 ceramic red poppies represented British and colonial soldiers who lost their lives. The work’s title was taken from the first line of a poem by an unknown World War I soldier. There was a brilliant exhibition of medals on display at the Crossing and an exhibition of photographs on World War I.